It would seem Google is constantly tinkering with the Google Feed, which used to be Google Now, and will now be called Discover. You may not be familiar with the name Google Feed, but you sure have seen it. It’s the pane that sits on the left of the launcher on most stock Android phones, and surfaces relevant content based on what you have searched, shown interest in, updates from sports teams you follow and more. Google says more than 800 million people use the feed each month, which means it’s a major point of discovery for news stories and links, and that’s why Google is changing the name to Discover. It’s simpler and to the point, while Feed is a bit ambiguous. The new name brings a new design which has more white space than ever, neat shadows to indicate cards and information hierarchy, and many new features. You may have seen topic flags in Google feed. There are now topic headers in Discover, which explain why you’re seeing a particular card and you can dive deeper into the topic by just tapping on it. There’s a Discover icon next to each topic that makes it easy for you to start following it. Basically Google’s algorithms will hunt down the best stories in this topic and surface it to you in Discover. The new look includes videos and visual content, and places emphasis on so-called ‘evergreen content’ – which are essentially features, videos which aren’t new but are related to the topic, and make for interesting reading or viewing. “For example, when you’re planning your next trip, Discover might show an article with the best places to eat or sights to see. Suddenly, a travel article published three months ago is timely for you. This can also be useful as you’re taking up a new hobby or going deeper on a long-time interest,” Google’s Karen Corby, Group Product Manager, Search, said. Discover will also automatically learn how much you know about a particular topic and can show you articles of a different kind as you go deeper into any topic. “If you’re learning to play guitar, for example, you might see beginner content about learning chords. If you’re already a skilled musician, you may see a video on more advanced techniques,” Corby added. You can also control how much you want to see inside any given topic, and control the sources that show you the stories. Google says users will be able to tweak Discover to show certain topics in certain languages. “You may like to use recipes in Spanish and read sports in English, and you will see content in your language of preference for each interest.” Multi-language support is beginning with English and Spanish in the US and coming soon to other countries. The Google Discover experience is coming to google.com on all mobile browsers, so it’s going to become a much more familiar part of the Google product family. As such it will have a much bigger impact than ever before, since it was so far confined to the Google app. Google says most of the changes in Discover will be coming in the next few weeks, along with support for google.com on mobile. 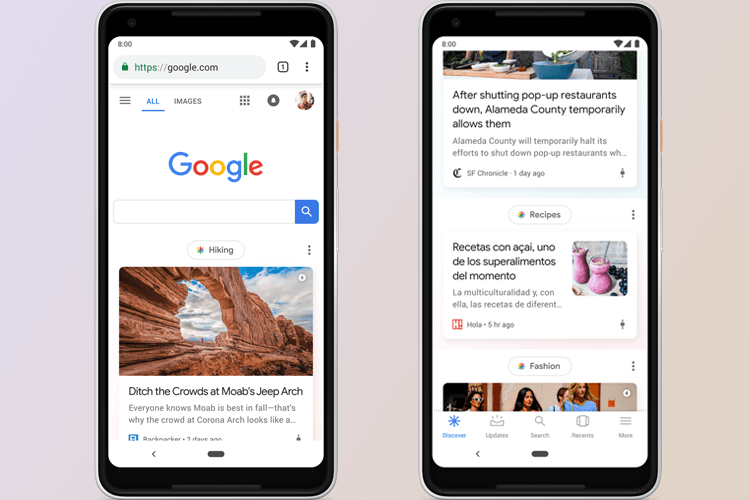 We must say that Google is neatly aligning the Google News app with Discover with a similar design aesthetic and similar features. It’s almost unlike Google to have such synchronicity, but it’s a pleasant surprise.